So remember that new sewing machine I mentioned I bought myself before the holidays? I’m IN LOVE. It is incredible. I was withholding full judgment until I got my first real quilting project under its belt, but low and behold, here it is. This is the Mod Mosaic Floor Pillow, designed by Elizabeth Hartman of Oh, Fransson! fame. I’ll be gifting this tonight to my pal Adria. Every year, I usually ask her what she would like me to make for her birthday, and the last few I’ve knitted her something. 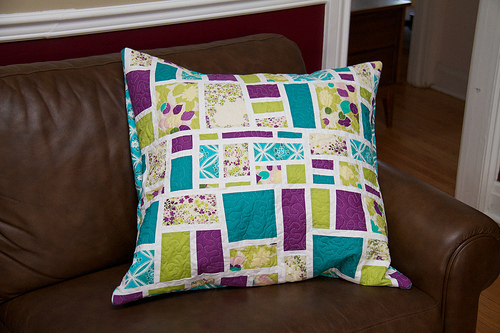 But I was itching to put the new machine to the free-motion quilting test, so we decided I would make her a pillow for her bedroom (that’s why it really does NOT go with my brown leather couch at home, pictured here!). Both the front and back of the pillow are quilted, making the seams of this pillow exceedingly thick — with three layers of batting and six layers of fabric where the overlap occurs on the backside. This made it the ultimate test for my machine, which trucked along sewing with ease. I have every confidence now that I made the right decision buying my Baby Lock Grace. 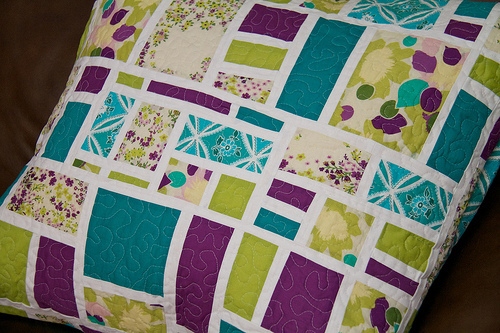 The piecing of this pattern is very versatile and can be done for virtually any size pillow or quilt blocks, and so I think I’ll be using that again. 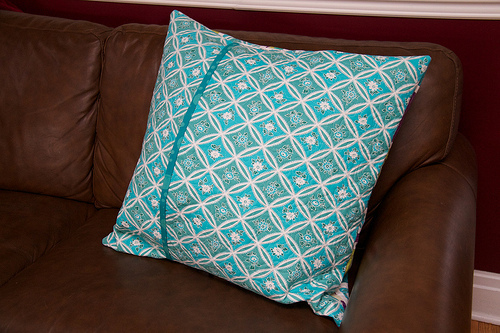 I also love how this pillow uses an overlap at the back for a closure, so no zipper is necessary. 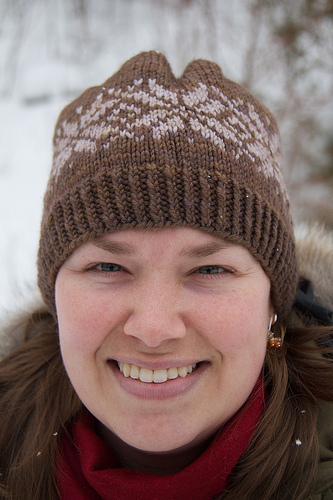 Next up is this Norwegian Star hat, made for my mom, to match her new winter coat (yes, I know, winter has been going strong for some time now). Her new coat is sort of a tan-purplish grey, making her last hat totally mismatched. I made this with Malabrigo Twist in Terron and Zinc, two colours that are so yummy together. This yarn is deliciously soft. It feels like 100% cotton but it’s merino wool! Mom will get her hat next weekend when they visit the cottage. Finally I finished something for Chris that fits. A scarf to match his hat. I used the same yarn, bought from Americo Original. 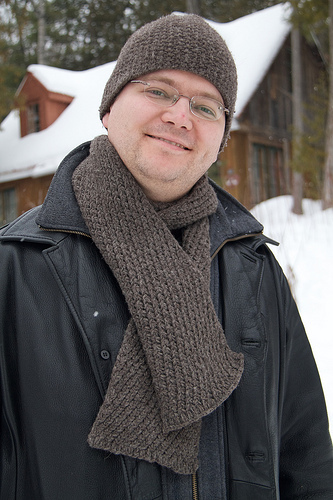 I wouldn’t call this a very soft yarn — in fact I would find it a bit too scratchy for a scarf, but Chris loves it. I really struggled with this scarf; the pattern was killing my hands due to the purling three stitches together repeatedly. But eventually I loosened up the tension and things got easier. 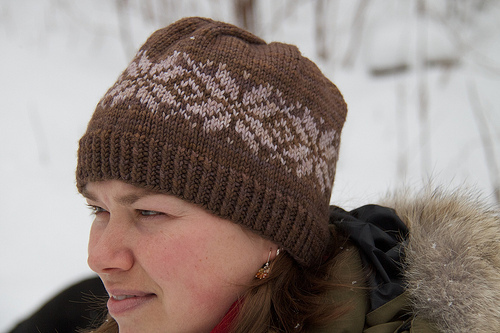 Both of the above patterns are available for free as Ravelry downloads.